I have a New American Standard Bible, do I need to switch to an English Standard Version? What is the difference anyway? Is one better than the other? When Precept Ministries offered the New Inductive Study Bible in the NAS and ESV those were the questions a lot of our friends were asking. But before we talk about the ESV versus the NAS we need to share a little background. The goal of a Bible translation is obviously to help the reader understand the text. Until the twentieth century the philosophy of Bible translation was to translate the Hebrew, Aramaic, and Greek words of the Bible into the closest possible equivalent in English. In other words the translator’s aim was to be as literal as possible and still be readable. This method is often referred to as a literal or word for word translation. However, the title is a little misleading because we cannot effectively translate exactly word for word from the Biblical languages into English without the end result being unreadable. In the mid-twentieth century the idea of a dynamic equivalent was introduced. This is commonly referred to as a thought for thought translation or a paraphrase. The goal is to translate the idea or thought in the original language to a corresponding thought in English. Translations like the King James Version, American Standard, New American Standard, and English Standard are on the more literal side of the spectrum. Bibles like The Message and The Living Bible are much more on the dynamic equivalent side of the scale. And scholars often place the New International Version in the middle of the scale. What made the New American Standard so popular? The NASB has always been popular with serious Bible students because the translators tried to “render the grammar and terminology” of the original languages into English. And they worked at being as literal as possible. English Bible students have always wanted to know exactly what the text said so they could be the ones to determine for themselves the meaning. The NASB meets that need. What about the English Standard Version? The ESV is popular, among other reasons, because it is translated in a “current literary English.” Or, to put it another way, the ESV is understandable and sounds like current English literature. It sounds modern. 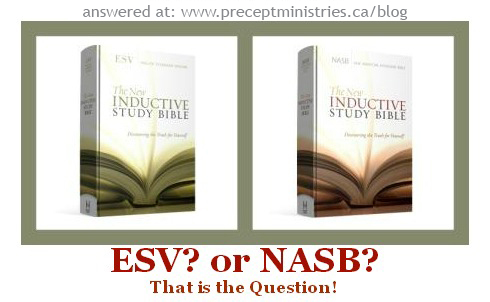 What are the differences between ESV and NAS? Most scholars rank the NAS as a bit more literal word for word translation. Some think, but not all, that some of the Old Testament passages are a little “wooden”, so literally “word for word”, that they are hard to read. Many scholars and students, but certainly not all, think the ESV is smoother and easier to read. If this is true it is because the translators opted for readability over literalness in some passages whereas the NAS usually chose literalness over readability. There is no one translation that will ever be universally accepted as the perfect translation. However, for the English speaking world, both the ESV and NASB are excellent translations directly from the original languages. The following is a link is to an interesting chart from Zondervan Publishing giving you a comparison of the major English translations. You should know that Zondervan publishes the NIV so you will notice a distinct slant in that direction. In the end the version you choose to study from is a personal choice. Both the ESV and the NAS will serve you well. The issue is will you study the one you have? No Bible is of any value if you do not open it and read it. There is nothing especially powerful about a Bible lying on a table. But once you open it and begin to study it there is nothing more powerful in the whole world. The Bible is literally the word of God. His words are powerful, sharp, penetrating, and very dangerous. The word of God changes cultures, tribes, cities, countries, and even individual lives. Whichever version you choose, read it. We have our New Inductive Study Bible available in both NAS and ESV. Don’t miss this opportunity to purchase a Bible that will actually train you to study for yourself. And I am convinced that nothing can ever separate us from God’s love. Neither death nor life, neither angels nor demons,* neither our fears for today nor our worries about tomorrow—not even the powers of hell can separate us from God’s love. 39 No power in the sky above or in the earth below—indeed, nothing in all creation will ever be able to separate us from the love of God that is revealed in Christ Jesus our Lord. Just wondering if there is any difference between this version of the NASB and the previous printed version of the NASB study bibles? Hi Karen, there hasn’t been any change to the NAS translation since 1995. Therefore the only changes would be minor, such as a result of proofreading errors that may have been caught since the previous printing.